In partnership with AARP Foundation, CMP is providing a series of workshops on Work for Yourself@50+ to help older adults learn the ins and outs of successful self-employment. Our next workshop will be on Wednesday, February 27th from 6 PM to 8 PM. For more information, please contact (212) 571-1698 or (646) 292-9672. 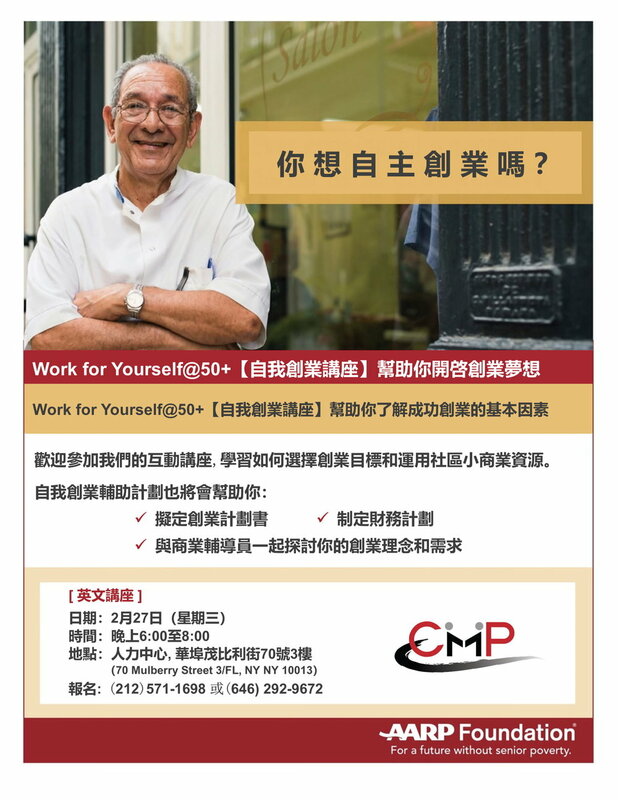 In partnership with AARP Foundation, CMP is proud to present Work for Yourself@50+ workshop to help older adults learn the ins and outs of successful self-employment. Our next workshop is on Wednesday, September 19th from 6pm to 8pm and it will be conducted in Mandarin Chinese. For more information, please contact our Business Counselor Larry Mei at (212) 571-1698.